At the age of 82, James Lee Burke is still churning out novels. 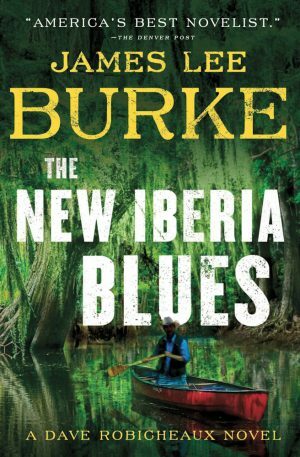 The New Iberia Blues is the 22nd installment in a series of detective mysteries that began in 1987, when Burke introduced Dave Robicheaux to readers. Robicheaux is a complex protagonist, a man of principle and honor, a Louisiana native who spoke French with his parents. He is a man who had his soul and psyche seared during a combat stint in Vietnam, by years walking a beat in New Orleans, then as a homicide detective in New Iberia. Robicheaux has seen the worst depravity and violence people are capable of. He’s been married three times; two of his wives died violently. As if this isn’t enough weight for one man to carry, Robicheaux is also a recovering alcoholic, as regular an attendee at AA meetings as he is at mass. His battle against the desire for Jim Beam shots and beer chasers is as constant as the recurring dreams he has about Vietnam and his dead wives. James Lee Burke is a literary craftsman. He brings the landscape and people of southern Louisiana to life, the bayous and cane fields, the gum trees and old plantation homes and shotgun houses, the smell of gas on the breeze and the sound of rain beating on a tin roof.